Cheesy Ham and Broccoli Twice Baked Potatoes - Home. Made. Interest. 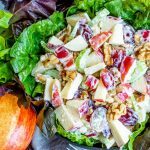 So excited to be partnering with Smithfield to bring you this delicious recipe for Back to School! All opinions are 100% mine. 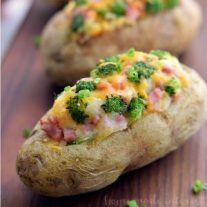 This easy Ham and Broccoli Twice Baked Potato recipe is stuffed with cheese, ham, and broccoli all put back into a potato shell and baked a second time. I’ve always liked twice baked potatoes. You get all of the creamy goodness of mashed potatoes served inside of a delicious baked potato shell. I’ve made cheesy twice baked potatoes for years but with the busy back to school season here I’ve been playing around with the ingredients adding things like ham and broccoli along with the cheese to make them a complete meal. The kids love them, I love them. We’re all happy and it is so easy! For these cheesy Ham and Broccoli Twice Baked Potatoes I started with a large russet potato that I washed, pricked with a fork, and cooked in the microwave for about 10 minutes until it was fork tender, just the way you would want your usual baked potato. When those bad boys come out of the microwave they are HOT! So I sat them aside to let them cool slightly while I prepared the ingredients for the stuffing. First up the ham. 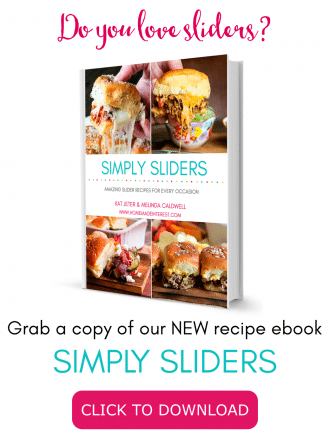 Smithfield Hickory Smoked Premium Quarter Boneless Sliced Ham is perfect for this recipe. Smithfield Anytime Favorites come in different cuts, sliced, diced, cubed, chops and steak so you get just the right portion. 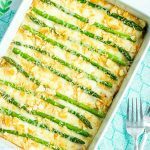 It is a total lifesaver when it comes to getting dinner on the table on a busy week night. The ham is already cooked and sliced all you have to do is pull off several slices and dice them into little pieces. Next is the broccoli. I use just the ends of the broccoli and cut them into small pieces then I place them in a bowl with a little water, cover them with a damp paper towel and microwave them for 1-2 minutes or until tender but still nice and green. 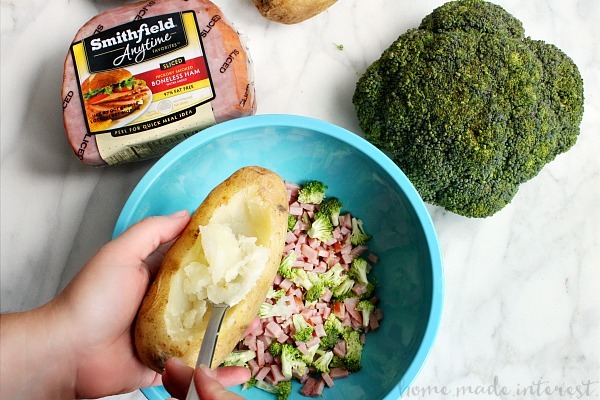 The ham and broccoli goes in the bowl with some cheese and then it is time for the potatoes. Hollow out each potato by cutting a circle out of the top of the potato then scooping out the insides. Everything you scoop out goes in to the bowl with your ham, broccoli, and cheese. Add a tablespoon of butter and mash everything together. You don’t need to get it smooth but you do want nice creamy potatoes for your filling so add a little cream and salt as you go until you get them to a creamy but firm texture. Then stuff all of that ham and broccoli mashed potato goodness back into the baked potato shells and stick them in the oven for about 15 minutes or until they are warm all the way through. When the Ham and Broccoli Twice Baked Potatoes come out of the oven sprinkle a little more cheese over them and dinner is served! The extra awesome thing about this recipe is that you can make it ahead of time and freeze the potatoes for later. If you decide to do that let your finished potatoes cool completely then wrap them in aluminum foil, put them in a freezer bag, and put them in the freezer. When you are ready to use them the best thing to do is take them out of the freezer the night before and let them thaw in overnight. Then reheat them by baking them in a 400°F oven for 15 minutes or until warm all the way through OR heating them up in the microwave for 10-15 minutes until warm all the way through. If you cook them in the oven make sure to tent them with foil to keep the outside from over cooking. 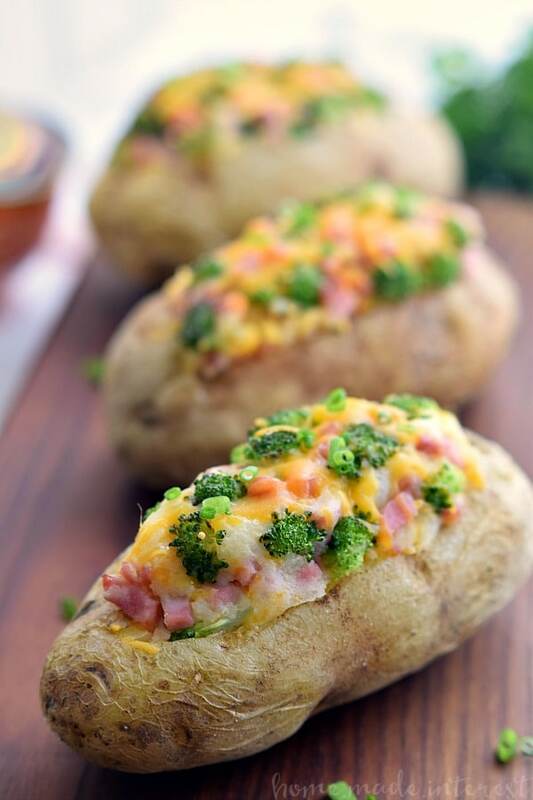 These Ham and Broccoli Twice Baked Potatoes have been a hit in my house and they’ve made getting the family fed in between running from school, ot PTA meetings, to sports practice a little easier. These ham and broccoli twice baked potatoes are stuffed with cheese, ham, and broccoli all put back into a potato shell and baked a second time. Prick potatoes several times with a fork and cook in microwave for 10-15 minutes or until fork tender and fully baked.Let potatoes cool for a few minutes while you prepare the broccoli. Place broccoli in a small bowl with a tablespoon of water and cover with a damp paper towel. Cook in microwave for 1-2 minutes or until tender but still bright green. Use a sharp knife to cut a circle out of the top of each potato. Remove circles from potatoes and hollow out the inside of each potato placing removed portion of potatoes into a large bowl. 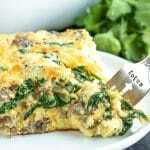 Add butter and cream to the bowl and stir together withe a spoon until potatoes are creamy. Add ham, broccoli, and cheese stirring to combine. Add salt to taste. Scoop mixture back into the potatoes filling them equally. Place potatoes on a baking sheet and bake them in the oven for about 10 minutes or until the potatoes are warm all the way through. 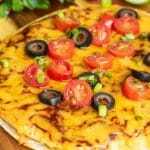 Remove from oven, sprinkle with a little more shredded cheese and enjoy! You can find select Smithfield Anytime Favorites in grocery stores. 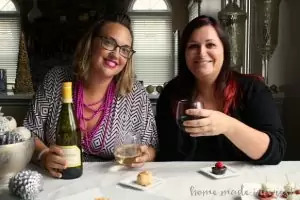 If you’re looking for some more delicious recipe ideas you can visit www.Smithfield.com or Smithfield’s Facebook page. Now these are amazing. Not sure why I’ve never thought to throw ham in a twice baked potato, but I’m so glad you did! YUM!